This portering chair was originally manufactured to meet the criteria of the portering staff within the Glasgow Health Board. 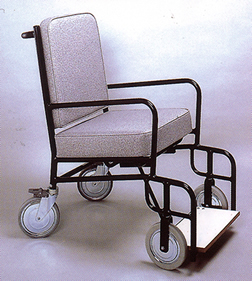 The seat and back are reclined and the wheelbase lengthened to increase stability, enabling the full width footboard to be stood upon without tipping the chair. Drop-Down Arms, Telescopic Legrests, Integral I.V. Drip Pole, Luggage Basket, Document Pouch and Lap & Diagonal Seat Belt can be fitted as optional facilities.